Can something be done to prevent it?There are basically two techniques to force open a shutter: attacking the shutter as it is (breaking through, pulling, or cutting it), or neutralising the lock so that the shutter can be easily lifted, and possibly even closed so that the thieves can “work” undisturbed inside. Choosing a good shutter, providing a sturdy lock and installing it correctly are fundamental measures for the security of a shop, warehouse or garage, in order for it to withstand both types of attacks. Unfortunately, the locks provided as original equipment for shutters are often of poor quality, possibly made of simple pressed sheet metal, and easily vulnerable to attack. The cylinders are not resistant to drilling, whilst the body and the dead-bolts break easily under the action of tools such as crowbars. The locks fitted as standard on shutters are generally easily vulnerable to attack. 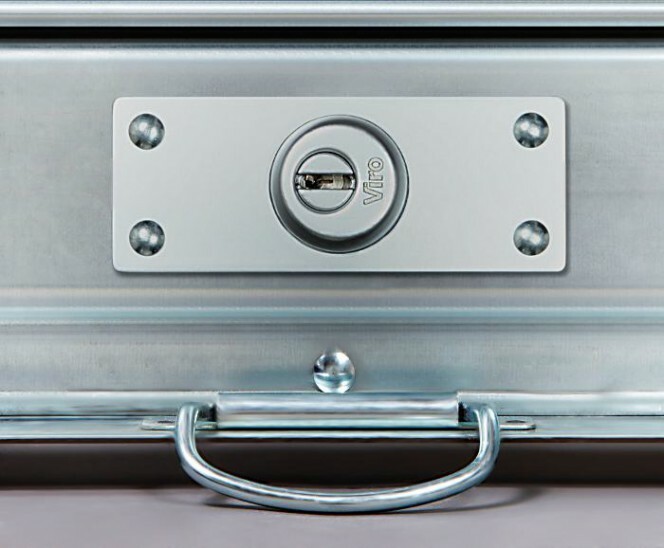 A more secure alternative is the use of armoured locks which have stronger dead-bolts and a structure and cylinder protected against brute force attacks, such as the Viro 8217 complete with handle and release for opening from the inside. Viro 8217 armoured lock, with 2 galvanised steel protection plates with a total thickness of 5 mm. 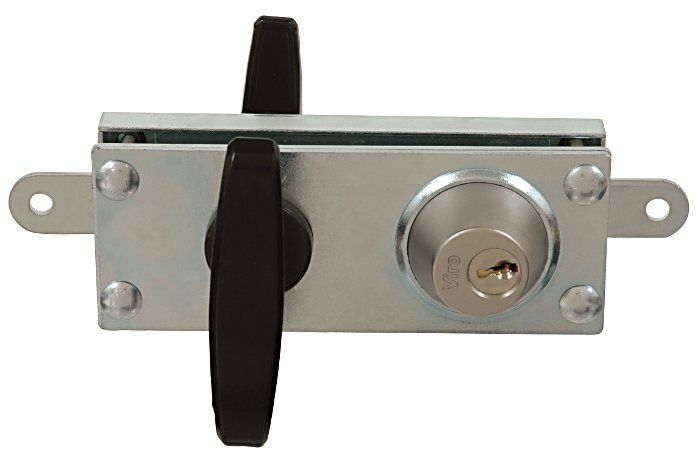 Or the extremely new Viro 8271 (available since the beginning of 2014), which has been designed to be easily interchangeable with the most common shutter locks already installed, and with a half cylinder which can be easily replaced. 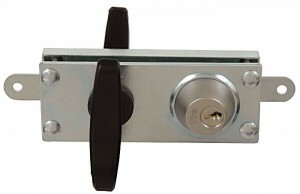 The new Viro 8271 armoured lock for shutters, with interchangeable half cylinder. In both cases the lock is protected against pulling and drilling, the case is reinforced and protected by a galvanised steel plate, and the dead-bolts have a greater thickness (3 mm in the 8217 and 7 mm in the 8271). Of course, the strength of the lock must be balanced with that of the shutter, so security locks are the ideal complement to good quality shutters. or use a pair of key, one for the inside and one for the outside, with a mirrored profile. The second solution is clearly the most secure and the one which, precisely because of the greater number of combinations which it offers, lends itself better to master key systems. Lock, padlock or fastening unit? Another alternative which is more secure than a normal lock fitted as standard is to use a good quality padlock, which fixes the shutter on the ground. Its anchoring to the ground is precisely the strong point of this solution. In this case it is essential to use fixing rings which have the same strength as the materials used in the manufacture of the shackles or rods of the padlocks (hardened and tempered steels), to prevent the thieves from simply cutting the fixing points; moreover, the latter must be specially designed to perfectly match the specific padlocks, in order not to leave room for the insertion of any burglary tools between padlock and rings. In fact, as we have seen in a other article a padlock fastened in an unsuitable manner leaves too much space and allows insertion of a crowbar. So it is better to use a fastening unit for shutters which, with its thick armour, effectively protects the floor fixing point. A fastening unit, such as the Viro New Condor, for shutters has a thick armour to protect the cylinder and makes it especially difficult to insert burglary tools. Double side locks or single central lock? Side locks have the advantage of having shorter dead-bolts and they are therefore less subject to leverage. 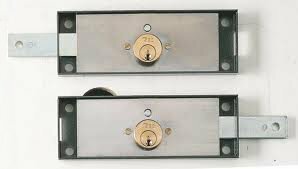 The choice between side locks and a single central lock depends mainly on the width of the shutter. If it is less than 2.5 metres a single central lock may be sufficient: if it is wider than this, 2 side locks are recommended. If it is wider than 4 metres, 2 fastening units are recommended, as they provide a better seal. It is possible to set up keyed alike systems with Viro locks and fixing units, so that all the locks open with the same key. 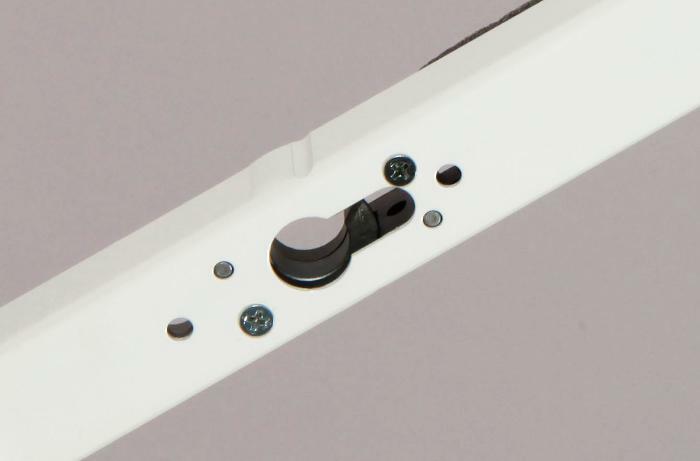 The Viro Universal Locking Bar has the advantage of improving both the security of the lock and the mechanical seal of the shutter against pulling and breaking through. From the point of view of the lock, the locking bar provides the possibility of installing any type of European profile half cylinder, thus allowing the selection of high security products, too. 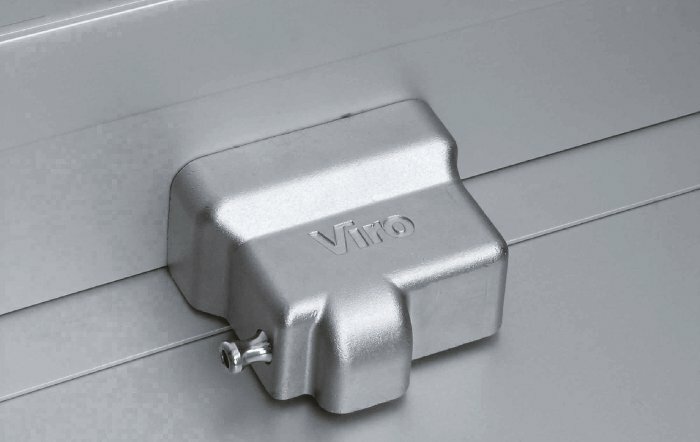 The Viro Universal Locking Bar allows installation of any European profile half cylinder. The cylinder can be further protected by fitting a drill-resistant and pull-resistant escutcheon. The escutcheon which protects the half cylinder of the Viro Universal Locking Bar from the outside. The body of the locking bar can also be mounted on the base element of the shutter, reinforcing it against breaking through. The body of Viro Universal Locking Bar improves the resistance of the shutter. In order to withstand pulling, there are two dead-bolts with solid steel anchoring ends with a diameter of 14 mm. 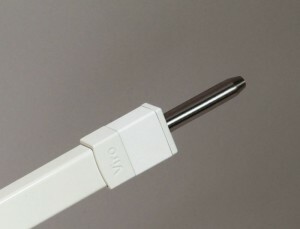 The dead-bolts of the Viro Universal Locking Bar are made of solid steel and have a diameter of 14 mm. As always, the overall security depends on the security of the weakest link in the chain, which in many shutters is the lock. The use of a more secure solution compared with the lock fitted as standard has little affect on the overall costs but provides an important contribution towards the overall strength of the shutter.